Below is a detailed description and comparison of the best dive scooters/diver propelled vehicles (DPVs) of 2019. For each scooter key features and benefits are outlined. At the end is a comparison chart. At times an item will be out of stock. Apologies for that. Frequently it won’t be long before the item is back. The Tusa Sav 7 Evo2 is a high performance model with some improved features from the earlier version. It includes a lithium ion battery, charger, hands free saddle and has 10% more torque than the earlier SAV-7 EVO model. Continuous cruise time in open water of 70 – 110 minutes is attainable. The average cruising range in open water is 2.25 – 4.5 miles. There is a progressive acceleration system using a trigger with use of a saddle and 3-speed pitch propeller. It is well suited for underwater photography, videography and spearfishing. The Next 3 scooters are part of a series of 3: Yamaha 500Li 350Li and 220 Li. The features are similar with some gradations. This is the top of the line in the series with 500 watts of power from its Lithium Ion battery providing more bottom time using less energy. It has 3 level rotational speed control, a battery level indicator and a superior flood prevention system. It is hydro-dynamically designed with a double trigger control. This is a full featured model like the 500Li, with a Litium Ion battery with 350 watts of power, upgradable to 500 watts. It has the same 3 level rotational speed control, battery level indicator and superior flood prevention system. This also is a full featured model like the two above, with a Litium Ion battery of 220 watts upgradable to 350 or 500 watts. It has a 2 level rotational speed control, battery level indicator and superior flood prevention system. The Yamaha Seal is a low price scooter with a solid brand name and some nice features. It has a sealed battery, lightweight, waterproof construction and is suitable for kids. It travels to 15 feet at a speed up to 2 mph for up to an hour and a half. With the GoPro camera mounted, the weight is 12 pounds. This Sea Doo scooter can reach speeds of 3.10 mph for up to 60 non-stop minutes on one charge of its Lit-ion detachable battery. It travels to 160 feet in maximum depth and has a two gear adjustable speed system. The hull on this model creates neutral buoyancy and is appropriate for adults and kids. The Sea Doo brand is well known for their underwater scooters for all uses. This DPV in particular is ideal for children and adults from the age of 8 plus that is built with safety in mind. It has features such as a floating chassis, automatic shut down, large protective grills and a built in place to mount a GoPro camera to capture it all. This scooter has a maximum speed of 2 miles per hour and is depth rated to 15.5 feet. This kind of use will allow about 1.5 hours of run time. The Yamaha brand is known for its powerful reliable outboards for boats and increasingly for sea scooters. The RDS 300 is rated for depths of 100 feet. It can reach 3 mph in salt water, and has an impact resistant, waterproof hull. It is equipped with auto shut off, a thermal switch function and a sensor for water leakage. It is known for reliability. The RDS 250 scooter can go to 100 feet in depth like the RDS 300 above. It moves at speeds up to 2.5 mph for a run time of 2 hours and a maximum depth of 100 feet. It also has a removable buoyancy controlled chamber and uses a sealed lead acid battery. The Apollo AV-2 Evolution 2 can descend to 230 feet and has cruising range of 4.5 miles. It is capable of towing more than one diver for over an hour and a half on one charge. Diver propulsion vehicles (DPVs), also known as underwater propulsion vehicles (UPVs), or more simply, dive scooters, were first devised for mililary and commercial application. 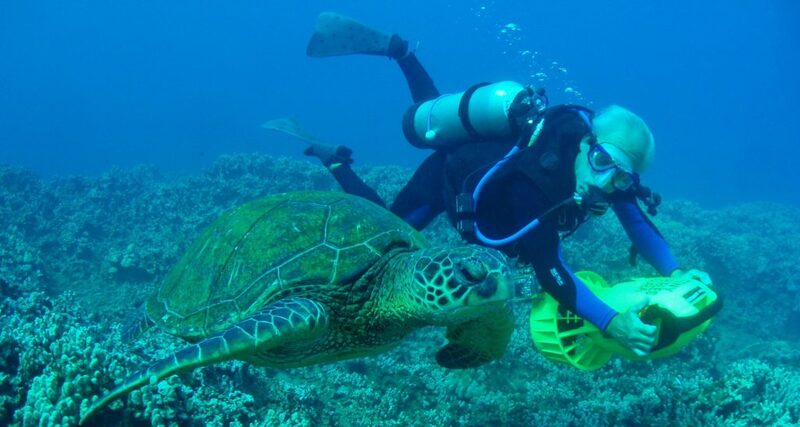 They are becoming increasingly used by technical and recreational divers, snorkelers and kids in swimming pools who want to cover area more quickly and increase range. Range is only limited by dive table limits, amount of breathing gas carried and battery power. DPVs are constructed with a pressure resistant, watertight casing, and are equipped with an electric motor driving a propeller which is housed in a design that eliminates chance of damage to the diver, equipment or surrounding wildlife. This design must ensure that it cannot be started accidentally and is neutrally buoyant so as not to be able to run away from the diver. Typically the scooter has two handles with which the diver steers and controls speed, which is usually a maximum of 2 knots. DPVs are popular with tech divers because they help make long dives more comfortable and conserve gas, and can provide assistance in fighting against currents. Also, on very deep dives, they make carrying a number of stage bottles or other support equipment easier to manage. Non-tech divers are also intrigued by the small, cool, attractive vehicles. It is not far removed from feeling like being in some sort of a sci-fi or spy movie, speeding along behind the propeller through the otherworldliness of the sub-sea environment. Practically speaking, they’re pretty useful for both types of divers. The risk of strong currents is decreased and it is possible to cover a much larger area without the usual physical strain, meaning that dives can be extended a good bit due to lower air consumption. Purposes – DPVs come in different shapes and sizes based on the purpose. Those for military or commercial use can be designed for a bigger load of materials and more than one diver. They can be equipped with a mounting board that can carry additional gear such as compasses, cameras and even spear guns. The ones for recreational use are smaller and designed to pull the diver who holds onto handles on the stern or bow and are called tow-behinds. Speed – When using a DPV the speed can be considerably greater than the diver can manually propel himself. This applies to both horizontal movement and vertical movement. The diver should be particularly concerned with buoyancy. When moving horizontally at the maximum speed of 2 knots, poor buoyancy of the diver can be compensated for. But when slowing down, if the diver has not made adjustments to his buoyancy, it can cause loss of control and a descent or ascent to happen more quickly than is safe and can result in barotrauma. Navigation can be a concern. If you move more quickly being towed by a scooter it is possible to get disoriented more quickly. In overhead environments such as caves or wrecks, care needs to be taken to navigate carefully so as to be able to go directly to the exit point. Diving in these types of environments is best done with advanced training. In addition, keep in mind that the DPV is in large part made of metal, which can interfere with the functioning of a compass. Test your compass use before the dive to know how to keep it clear of the potential DPV interference. Power Limit – The DPV has a limited source of electrical power which is usually measured in hours. Often around two hours is the limit. Current, speed, water temperature, age of the battery and amount of use can all factor in to how long the power lasts. When the battery is dead, the scooter stops. Plan your dive conservatively. Tether yourself to the scooter, so as not to lose it, especially if you have a tow-behind variety. Most have pre-fixed attachment points. Your BCD has D-rings that you can attach to. The noise of the DPV, the electrical field generated by it or the shear speed of approach may tend to scare certain of the wildlife. If your purpose is to see such creatures that these aspects of scooter use affect, then you’ll need to consider not using one. Like a lot of scuba gear, Diver Propulsion Vehicles tend to be expensive. You should probably get some training before using one and for a reasonable fee a DPV would be included. Most of the scuba training agencies offer introductory and in some cases advanced classes. In some dive shops units are available for rental, but most will insist on some sort of training beforehand.